Lead generation is critical to your business. Marketing automation can take those efforts to the next level (and it’s more affordable than you might think). To answer that question, consider these five good reasons to implement marketing automation—it just might be easier and more affordable than you think. Reason #1: Marketing automation supercharges lead nurturing. Leads are the lifeblood of your business. One of the key benefits of marketing automation is being able to build and nurture your pipeline of leads more easily. Automation tools facilitate the core inbound marketing goal of sending the perfect message to your audiences at the ideal time. Eventually, this results in a greater number of qualified leads for your business, as your prospects sign up to receive more targeted content. From there, automation also collects and manages data about your leads that in a way that ultimately turns them into paying customers. Reason #2: Digital marketing makes cold calls warm. No one on either side of the phone enjoys cold calls. And when 50 percent of this sales prospecting time is ultimately unproductive, sales teams and marketers are looking for a new way to approach potential customers. Marketing automation makes it easier to turn cold calls into warm ones. Every time a lead shows interest in your content, he or she provides data your sales team can use to create and build the kind of personal, human relationships that vastly improve your customer acquisition rates. Reason #3: Your competitors are using it. While this isn’t the only reason to implement new marketing technology, the fact that your competitors are most likely already using marketing automation (remember that “51%” stat at the top?) is definitely something to consider. This isn’t about “keeping up with the Joneses,” this is about winning more business. Automation can significantly improve your chances—63 percent of businesses that are able to outpace their competition use marketing automation in one format or another. Reason #4: Marketing automation IS affordable. The rise of marketing technology has been driving down the costs of marketing automation tools. The most popular programs, such as HubSpot, have tiered pricing options designed to fit the needs of all different sizes businesses and agencies. For instance, HubSpot’s starter plan starts at just $50 a month for 100 contacts, with higher tiers for larger organizations. Marketo, another popular automation solution, allows you to build your marketing automation package based on your specific needs and the aspects that you want to focus on, such as email marketing or mobile marketing. Reason #5: Free solutions make it easy to get started. 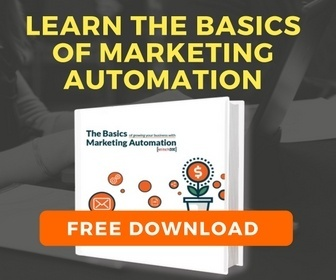 This one’s especially for you new and smaller business owners: Many marketing automation solutions offer limited free versions of their software to get you started. HubSpot’s free solution provides a lead generation dashboard, lead flows, collected forms, and lead insights. Other marketing automation solutions with free tiers include Leadsius, JumpLead and SalesAutoPilot. Not surprisingly, all these providers allow you to upgrade later as your business grows and its needs change. So now you’ve got five reasons why marketing automation is right for your business. For a deeper dive into how it delivers results for SMBs, download our ebook, The Basics of Growing Your Business with Marketing Automation. ← [NEW WORK] StitchDX partners with Hartford-based MoveUp to support innovative poverty solutions.